Is this where your thigh aches? Gate and fence I erected yesterday; sorry just bragging. Working above your head worsens the symptoms. Arms, fingers, and leg sleep or ache day and night demands a thorough examination. I am 35 and have always been in good health. For about 6 months, I've had an issue where my left thigh aches while sitting. This is particularly noticeable in my car, as I often drive 1hr+ at a time. This only occasionally happens to right thigh, but both legs are restless when I try to sleep. Now, just about week ago, after working fences hucking a chainsaw, barbed wire and tools through the woods, my arms and all fingers (but especially the middle, ring, and pinky) began to ache and fall asleep while doing normal, everyday tasks. The most odd thing is that the arm and finger tips opposite of the side I sleep on will go to sleep, waking me up. I went to a Licensed Massage Therapist, and later to a Chiropractor explaining my issues, but I am sitting here awake at 2am because it is not any better after treatment. Now it is happening when I lay on my back as well. I can get no real relief. Can you help? A man after my own heart, Chris. I too yesterday put up a fence, welded a gate and used the chainsaw. But these are heavy activities and a good stretching regimen before and perhaps after is important. Pain in the upper thigh requires careful analysis; it can be from the lower back, either the sciatic (back of thigh) or front of thigh from the femoral nerve. So too it can be a pinched nerve in the groin causing what's known as meralgia paresthetica; see the distribution above of the lateral femoral cutaneous nerve. 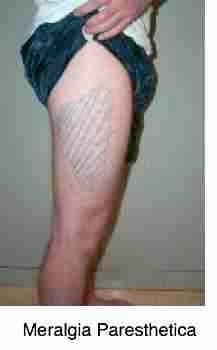 Lightly rub your fingers down the thigh, and prick with a needle; is the difference as compared to the right leg? Then sometimes upper thigh pain can be caused by a hip condition; is it painful and stiff in your pull your knee to the chest? These are all very treatable, but the right diagnosis, and hence the pertinent treatment is vital. Did you have the feeling you were carefully and thoroughly examined? Most likely these are two separate conditions. The middle, ring finger and pinkie is a slightly unusual distribution. When they start to ache and tingle, does raising your hand above your head increase or lessen the symptoms? Testing for a thoracic outlet syndrome is more difficult. 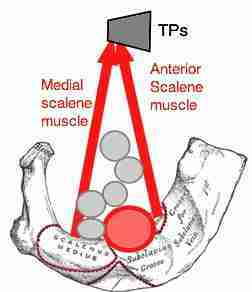 The pulse in the wrist lessens with certain specific movements; both the nerves and the artery may be affected in the interscalene triangle. Do movements of your neck provoke anything in the lower cervical spine or arm, especially turning and then looking up? 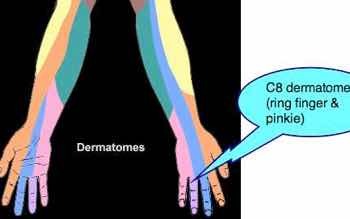 The upper limb tension test which you can do at home will tell if it's a pinched nerve in the spine. Rome wasn't built in a day; it takes a course of treatment to address these things; miracles we do at once but the impossible takes a little longer! There is nothing unusual about the upper arm being affected when sleeping; it stretches out the brachial plexus. You don't sleep on your tum do you? A common cause of tingling in the arms. I hope this all contributes to your conundrum. You'll find a lot of information at Chiropractic Help if you browse. If all else fails, see a neurologist; it's very unlikely to be something 'central' but it does happen.